I thought I knew what to expect as I pulled into the carpark of Robe Town Brewery, South Australia. Every other craft brewery I have visited throughout Australia has had the same format; uniformed staff, reminiscent of Harry Enfield’s Tim Nice-But-Dim character, serve you paddles of beer with attached cheat sheet and wish you good luck, like you’re embarking on some sort of intergalactic adventure. What I did not expect in this picturesque seaside town was to enter an old fish factory and be met by owner Maris Biezaitis, born in Australia to a Latvian family, dressed in a sleeveless t-shirt and sporting a haircut that wouldn’t have looked out of place in the early ‘90s. A former business journalist who has lived throughout Europe, Maris is one of the most out-there brewers I’ve met in recent years. He uses a mixture of old methods and new flavours to try and bring something different to the saturated world of Australian craft beer. He originally set up Robe Town as a nomadic brewery with his wife Kristi more than three years ago, brewing in Ballarat, a 250 mile, five-hour drive away. For the first couple of years he struggled on in this way, with saving his money and slowly converting the crumbling factory. One of the most noticeable peculiarities of Maris’s setup is the fact that he uses a wood fire in his brewing process. He is the only commercial brewer in Australia to do so, and one of only four or five in the world. He uses only Australian malts mashed in old wine barrels, straw filtration, open fermentation and aeration using atmospheric air rather than injecting oxygen in-line. Instead of using industrially produced acids, salts and minerals “like most brewers do” he treats the mash with sour beer that he makes himself. He also uses local, native ingredients like melaleuca, mulberries and “pigface”. As we talk, Maris is fronting the tasting shed while friends help bottle a new batch next door. The place is nicely busy for a Wednesday in the off-season and, as I walk to the toilet through the brewing room and a puddle of beer and water, it’s obvious that he juggles a lot of jobs. He believes there is a beer out there for everyone. A marketing man who once wandered in looking to pitch himself wandered back out with a variety pack of beer, despite insisting that he was teetotal. His beers are clearly his babies, to the point where he gets (only half-jokingly) offended when someone compares his Baltic porter to Guinness. He gets customers who “have different palates. 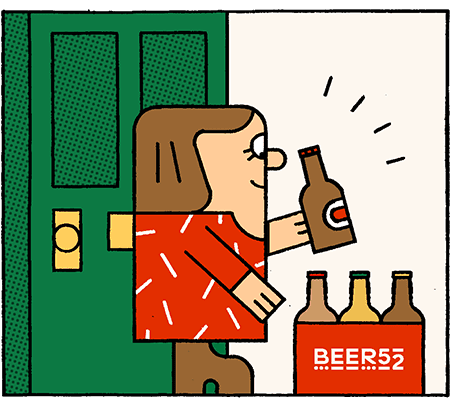 Their favourite beer tends to be cheap lager,” and I put my foot in it by making an innocent joke about poms liking warm beer when he offers me a cellar-temperature bottle. “Well if you swam in it you would still end up shivering!” he retorted. His big, ‘out-there’ ingredient though is surely ambergris. Originating in a sperm whale’s digestive system, Ambergris is expelled (use your imagination) and floats on the ocean surface, sometimes for years, hardening and maturing before being washed ashore. Finds of ambergris are rare and, partly because it is so prized by the perfume industry, it can fetch a price of up to $20,000 per kg. Maris uses it in his imperial amber ale. Obviously. “As far as I know, it’s the first beer made with ambergris. I like it but it can be a bit full-on,” he admits. “A bit” is an understatement; the initial taste is of perfume but it does eventually mellow out. This was an anomaly though; his other beers are actually very good. His brilliant Moon Hop IPA regularly sells out and is only available in his tasting shed; his Solstice porter tastes of sour cherries and is this writer’s favourite; and the aforementioned summer ale is superb on a hot afternoon. Life isn’t perfect for Maris though. He’s overworked (only he and Kristi are paid), his business is not efficient enough and he has storage issues in his tiny abode. He wants to export to big cities throughout the world, and – as he ends the interview early to dash off and grab some more bottle caps – it’s painfully obvious that if he can overcome these issues and make a name for himself, he could be on the verge of something big.